Jean Cooke: A Modern Venus has been reviewed for Apollo by Florence Hallett. The exhibition at Piano Nobile Kings Place opened on 2 January 2019. 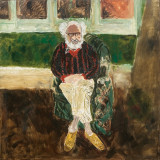 In the piece titled The Unsettling Domesticity of Jean Cooke, Hallett praised Cooke's work, writing that the exhibition was 'an important step in reconsidering an artist whose reputation has been almost entirely eclipsed by that of her husband'. She reserved special praise for Cooke's paintings of the Sussex coast, including Cave Painting I (c. 1965). The exhibition continues until 27 April 2019.